The arrest of Meng Wanzhou, chief financial officer and daughter of the company's founder Ren Zhengfei, spooked investors with U.S. stocks tumbling on fears of a flare-up in Chinese-U.S. tensions. China's Ministry of Foreign Affairs said officials have been contacted both in the U.S. and Canada to demand Meng's release. Geng Shuang, a spokesman for the ministry, said her detention needed to be explained, and both countries had to "effectively protect the legitimate rights and interests of the person concerned." 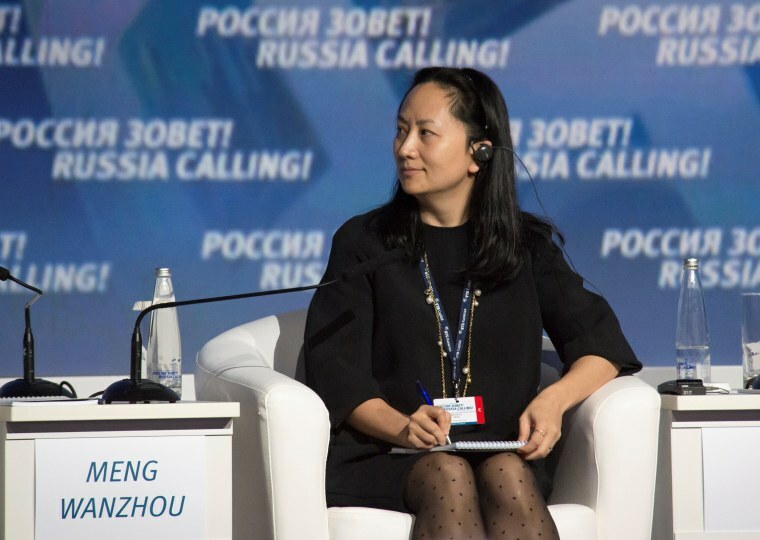 Sen. Ben Sasse, R-Neb., a member of the Senate banking committee and a subcommittee on national security and international trade and finance, praised Canada for detaining Meng while accusing Huawei of "breaking U.S. sanctions against Iran." When asked about the Iran reports, a spokesperson for privately held Huawei told NBC News in a statement that it "complies with all applicable laws and regulations where it operates, including applicable export control and sanction laws and regulations." Meng's detention came after President Donald Trump met with Chinese President Xi Jinping over the weekend and agreed to hold fire on the trade war between the two countries. On Wednesday, China's Commerce Ministry said the talks had been "very successful," but the statement was vague on a 90-day deadline for negotiations touted by Washington. There were mounting fears the arrest will have repercussions for other business travelers. James Andrew Lewis, director of the technology policy program at the Center for Strategic and International Studies, compared Meng's profile to Bill Gates' daughter and said China could retaliate. "If I was a tech executive I would not go to China right now," he said. The head of Canada's Centre for Cyber Security, Scott Jones, also addressed the risk of Chinese retaliation at a press conference Thursday saying, "we always have to be resilient no matter what the possible trigger could be." Earlier Thursday, the Chinese Embassy in Canada released a statement saying Meng was not in violation of Canadian or American law. China "firmly opposes and strongly protests" Meng's detention, the embassy said, calling the arrest a "wrongdoing" that "harmed the human rights of the victim." A spokesman for Canada's Justice Department said Meng faced possible extradition to the United States. Ian McLeod said a publication ban, requested by Meng, had been imposed in the case and he could not provide further details. Trump's tariff hikes this year on Chinese imports stemmed from complaints Beijing steals or pressures foreign companies to hand over technology. But American officials also worry more broadly about Chinese plans for state-led industry development they believe may erode U.S. industrial leadership. CORRECTION: (Dec. 6, 2018, 10:20 a.m. ET): An earlier version of this article misspelled the name of Huawei Technologies' chief financial officer. She is Meng Wanzhou, not Meng Wanhzou.